I have held a pilot’s licence since I was seventeen years old. I was an RCMP Non Commissioned Officer (NCO) in Alberta and the Yukon Territory during my career which spanned 25-1/2 years. I moved to a career in Investments where I built trust and a Company called True Track Investments Ltd. I sold the business portfolio and became the Western Canada representative for Quest Kodiak Aircraft for Clay Lacy Aviation out of Seattle, Washington. I expanded this business to used aircraft as well as Kodiak and began independently sourcing airplanes for Individuals, Corporations and Government Agencies here in Canada as well as other Countries. 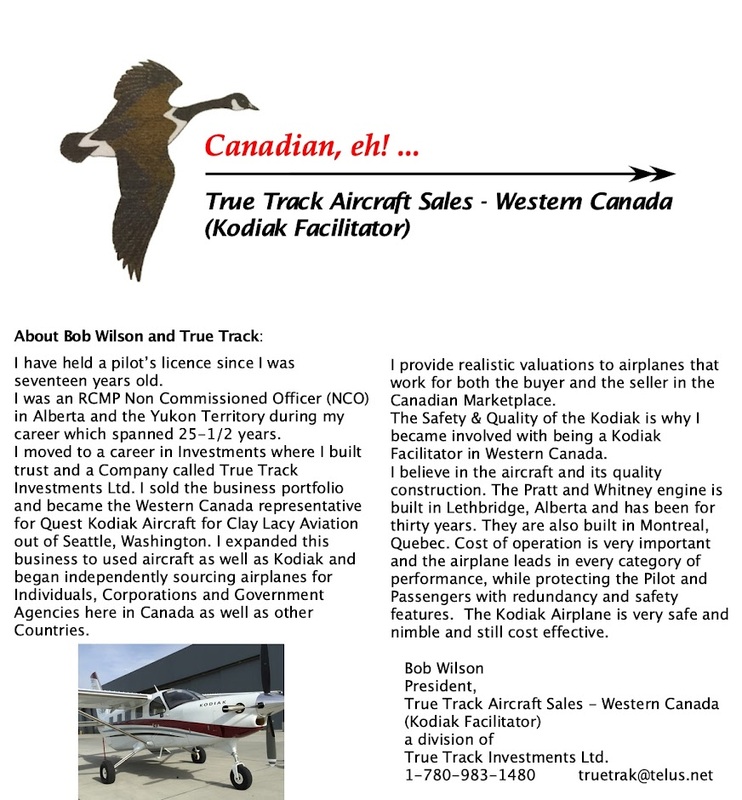 I provide realistic valuations to airplanes that work for both the buyer and the seller in the Canadian Marketplace. The Safety & Quality of the Kodiak is why I became involved with being a Kodiak Facilitator in Western Canada. I believe in the aircraft and its quality construction. The Pratt and Whitney engine is built in Lethbridge, Alberta and has been for thirty years. They are also built in Montreal, Quebec. Cost of operation is very important and the airplane leads in every category of performance, while protecting the Pilot and Passengers with redundancy and safety features. The Kodiak Airplane is very safe and nimble and still cost effective.